Teaching Tai Chi & Qigong to its full potential. FREE Tai Chi & Qigong live streaming Seminar in Altrincham Library on 4th June 2019! Seminar details: Our online teaching platform is going to host a FREE Tai Chi and Qigong seminar in Altrincham Library by Grandmaster Liming Yue. This event is fully supported by Altrincham Library and we are going to begin with conducting a open lecture about health benefits of Tai Chi and Qigong, then provide a series of performance and taster session of Tai Chi & Qigong exercises for beginners followed by feedback and question answers. This is a rare opportunity to talk and train with Grandmaster Liming Yue face to face in such a wonderful venue and facilities provided by the Library in Altrincham. The whole seminar will be broadcasting live through our online teaching platform and students in the seminar won't be shown in public as the Cameras are all focused on the teaching area only. The live broadcasting videos are also available to watch back later for those people who could not attend the seminar on site and who haven't got time to watch live show from worldwide. Booking Place: Please pay £1 registration fee to reserve your places on the seminar to avoid disappointment as the space is limited to 100 people. First come first serve apply. Watch Live Broadcast online: Our online teaching platform is fully built up and it is open to public. You can watch videos and live-stream classes and seminars with Grandmaster Liming Yue online. The official online teaching platform is hosted on www.chenzhenglei.com and we are part of Chen Zhenglei Taijiquan Federation. Please sign up as a user for FREE or a paid member as you prefered. Details: The Health Benefits of Tai Chi and Qigong exercises have been approved by many practitioners around the world regardless ages and levels of fitness. The most common health benefits are: reducing stress, losing weight, relaxing mind and body, improving correct posture and pattern of sleep, keeping fit, improving co-ordination, preventing fall, re-balancing the body, lowering down the blood presure, stopping back-pain and etc. There are so many more positive feedbacks from people who regularly practice Tai Chi and Chinese Health Qigong exercises. As a Tai Chi Grandmaster, I have been practicing Tai Chi and Qigong over 46 years and I have gained so many benefits of practicing Tai Chi and Qigong. I have also gained great success of self-defense skills and met so many nice people during my Tai Chi and Qigong training journey. In the old days, people found out all the old Tai Chi masters live longer, healthy and supper fit to defence themselves against young attackers. That is the main attractive thing to make people in the world to take up Tai Chi exercises for the way of living style. Membership is the Best Solution! Details: The membership of Tai Chi Centre is a great valuable package for students who wish to train hard in the Tai Chi Centre and improve Tai Chi skills and Health more sufficiently. The classes in the Centre are led by Grandmaster Liming Yue, Sifu Jamal Alek and Instructor Ivan Moss. It cover a wide range of classes and all the foundation and beginners classes are suitable for all new students who wish to join our classes. Please subscribe your membership with Paypal online payment system or set up a direct debit with us. 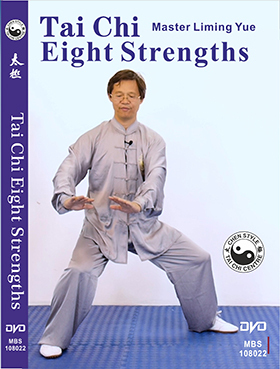 Tai Chi Eight Strengths DVD is available to purchase now. The Chen Style Tai Chi Eight Strengths DVD was demonstrated and instructed by Grandmaster Liming Yue in China and UK. This instructional DVD is suitable for both beginners and experienced students. The DVD includes an explanation and demonstration of each strength repeated from differnt camera perspectives and at different speeds with detailed commentary to maximise the benefits of practice. All footage was filmed in a professional studio with clear image and sound. We also covered an extra energy releasing movements for advanced training. The downloadable dvd is available to purchase at our new digital online shop.